I hope you are all enjoying your weekend. While I was in college I was fortunate enough to live in the south of France for a year. The beach was about 25 kilometers from campus, if I remember correctly. My classmates and I would hop on a bus as often as we could to spend time there. I miss it tremendously. I realized yesterday, when I heard of this fantastic weather, that I did not have a beach chair. I did, though, have a frame and some grain sack material. The wooden part is from Germany and dates back to the 1950's, I was told when I purchased it. The material is from Hungary. I am not bragging to you about the construction of this chair by any means at all. As I would not trust myself to take the chair apart and put it back together, I had to attempt to sew the fabric onto the chair itself. You should have seen me trying to maneuver this enormous chair around my sewing machine. I will certainly take it apart and redo it since I am not that happy with the outcome cosmetically. But it definitely worked as a comfy (and a bit chic, if I do say so myself) beach chair amongst the sea of plastic drugstore ones. I would be lying if I said that I did not wish to be on the shores of Deauville or under the beautiful blue umbrellas in Nice. 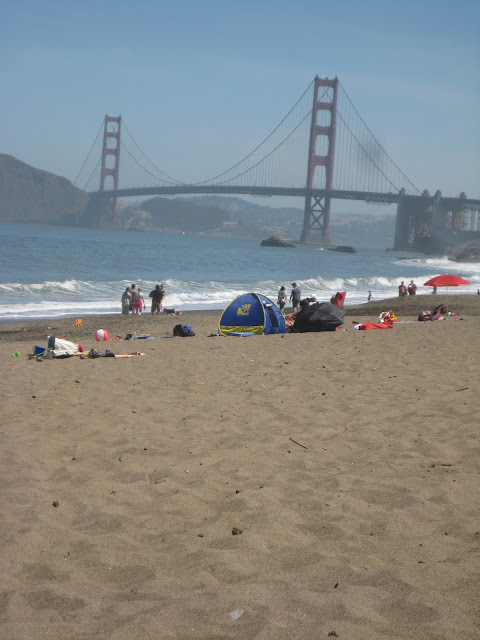 That being said, I am very blessed to be healthy and alive, have healthy children and family members, and to be able to sit on the warm sand underneath the Golden Gate Bridge. Please be sure to visit Dore's wonderful blog, Burlap Luxe. She is hosting a very generous giveaway that you will surely not want to miss! Rachel at Shabby French for Me is hosting a great giveaway! Check it out. Awesome, and the beach looks so fresh and wonderful! Michele, I would love to be in France too... however today is one of those magical low humidity days here in lancaster, Pa! So for today I love where I am. Your chair is priceless! What a great find. AND what a masterful job fitting it with the hamnmock. I can't even picture in my mind how you accomplished such a feat! You have a lovely blog... I am a new follower! Cute chair! Love that view you had on the beach. Glad that you were able to enjoy the beach finally! And San Francisco, my most favorite place!! It just has a certain vibe about it that I just love! Well I think your chair looks great! I think it is amazing that you were able to maneuver the chair around your sewing machine! What a lovely beach and a lovely day in which to enjoy it. My grandmother had several of the wooden frames like you have. She used awning fabric on them which had to be replaced every couple years! The grain sack is brilliant and perfect for your restful view of the Golden Gate! 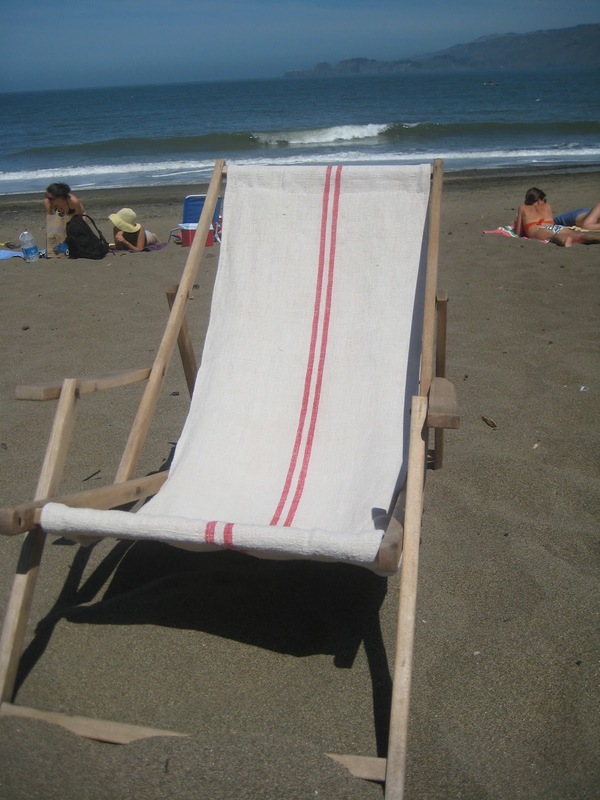 You have the best seat on the beach! It's funny but the first 'furniture' my husband and I bought when we first married was two chairs very similar to yours but the wood painted white and the fabric seafoam green. They were from world market and guess where we used them? In our apartment living room! Our first dining room table...a white wood round folding bistro table and chairs. We didn't have places like Ikea back then. 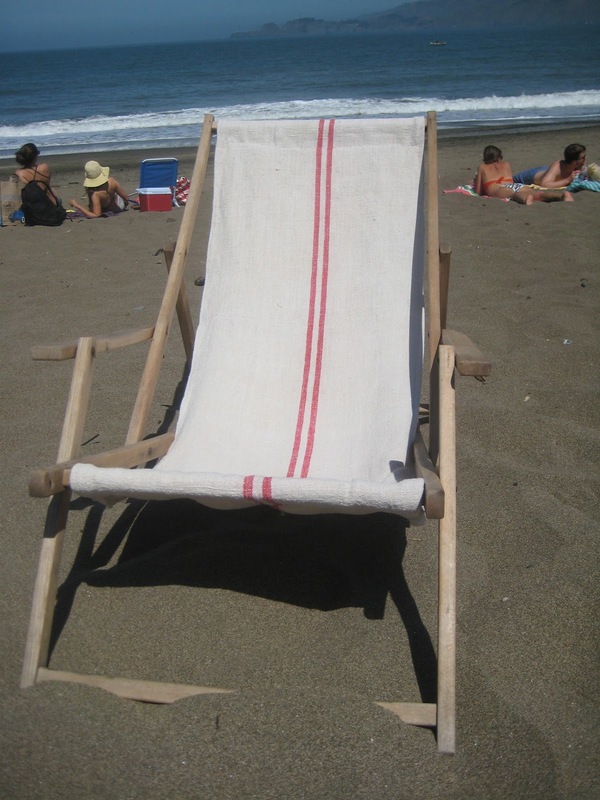 Love your vintage beach chair, it look fabulous, and I agree nothing measures of the the plastic ones. The Golden gate Bridge is a sight I so miss. I lived in the Bay area Los Gatos area and would make day trips to S.F often, shop, eat, and just taking in all it has to offer. You my girl have beauty all around you and thank you for showing me what I am missing out on. Michele your chair is stunning! What a great idea! I am SURE your beach chair was the most beautiful on the beach! Love your chair-and also your attitude! It is wonderful to appreciate what you have. :) Enjoy Fathers day! It's fabulous! I hate those ugly plastic chairs... i think you did a great job! Wow, what a fabulous chair. Have a wonderful week!